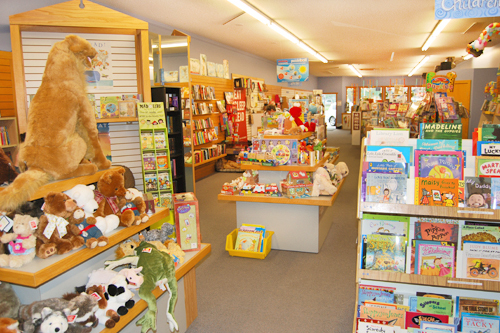 In April of 2010 my husband and I bought Rainy Days Bookstore in the heart of downtown Nisswa, MN. The bookstore had been in Nisswa for 19 years and I had many fond memories browsing through the stacks to find a treasure. We also realized any independent bookstore would offer plenty of challenges with competition from online sources, big box stores, and ebooks. We hoped we had enough experience in marketing and public relations from previous careers to turn the business around. 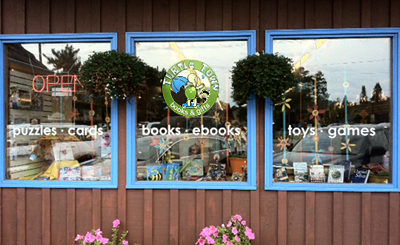 Part of our business plan was to add a website, and because another Rainy Day Bookstore existed, we changed our name to Turtle Town Books & Gifts. Because there are turtle races in Nisswa every summer Wednesday, and we were adding several toys, games, and gifts, we felt the new name reflected the spirit of the area and our new direction. This website marks a new era for books: a shopping cart allows you to easily purchase books in many forms: paper, audio, electronic. Our loyal customers who travel to warmer locations in the winter can still support Turtle Town. Our goal is to maintain the highest level of knowledgeable, friendly, and personal service. To that end, we are usually in the store to greet you when you come in. Our goal is to match you with a great book, puzzle, game or gift. Because half our store is devoted to children, we are a great destination for parents and grandparents. We choose our games and toys carefully for quality and value, and our puzzle lines are the best. We feature a weekly story time in the summer that?s guaranteed to create great memories. In the center of downtown Nisswa, between Ardor Boutique and Totem Pole.